Firefox 3.5 was released yesterday, and it has already reached 5 and a half million of downloads (at the time of writing). Therefore, I thought I’d answer some common questions, especially from a web developer perspective about the new version and which web developer extensions which will work with it. I have to say that I think Firefox 3.5 is an impressive release, it has gotten even better in so many areas! One very important thing is speed: according to performance God Steve Souders, Firefox 3.5 is the best-performing web browser, followed by Chrome 2, Safari 4, IE 8 and Opera 10. Even though you’re probably super-eager to replace all old versions of Firefox on your machine, please know that it is completely possible (and very simple) to have multiple installations of Firefox side-by-side; and, have them all running at the same time too, if you want to! You can download any number of versions of Firefox, and then just install it into different catalogs, or just give each installation a unique name (preferably version number). This is very useful, especially if you are a web developer, to quickly test something in a number of versions of Firefox. Then, naturally, you might want to have different settings, extensions etc installed depending on what version of Firefox you are running, and the easy way to control that is through different profiles in Firefox. 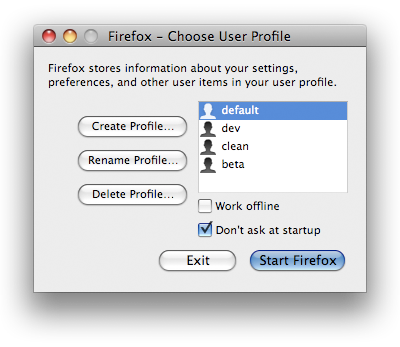 Basically, a profile is where Firefox keeps all your settings, preferences, installed extensions etc. Open the Terminal (located under /Applications/Utilities) and type in:/Applications/Firefox.app/Contents/MacOS/firefox -profilemanager. Choose Create Profile in the dialog and follow the steps. Remember to uncheck the Don’t ask at startup checkbox – that way, for any instance of Firefox you start, you can choose what profile you want to use. Support for the audio and video elements. Supporting @font-face rules for downloadable fonts. Support for CSS media queries, meaning support for media-dependent style sheets. The :before and :after pseudo-classes now fully support any CSS 2.1 variation. -moz-opacity has been fully removed, and replaced by the standardized opacity property. Support for the -text-shadow property. Support for the word-wrap property. The white-space property now also supports the pre-line value. CSS transforms, via the -moz-transform and the -moz-transform-origin properties. Are web developer extensions ready? Naturally, the most common thing that hold web developers back from upgrading is if their favorite tool will work with the new version. If we look aside the possibility of running multiple versions of Firefox at the same time, and instead at the most popular Firefox web developer extensions and Firefox 3.5 compatibility, things are looking good! The best web developer tool in the world does work with Firefox 3.5! The latest version, 1.4, is in a beta state, and as a user and developer of extensions to Firebug, I think it’s not perfect just yet, but it does work well overall. The Web Developer toolbar works just fine with the new Fox! Besides Firebug, this is one of the extensions I have become completely dependent on! And luckily, the new version 0.8.5.8 works just fine! Note: you can only download the Windows version from the Add-ons web site, whereas the Mac and Linux versions are available in the developer’s own web site (what’s up with this?). Above-mentioned Steve Souders have made sure that his Page Speed extension to Firebug works. And, if one takes a look at the Web Developer’s Toolbox Collection in the Add-ons web site, you can see that every extension but one is compatible with Firefox 3.5. The only one I have found, that I use, that won’t work with Firefox 3.5 is YSlow. And really, I don’t know why YSlow isn’t ready for Firefox 3.5. I think extension developers have had quite some time to prepare, and Mozilla have helped out well with their article Updating extensions for Firefox 3.5. My only guess is that the YSlow people didn’t feel ready to develop for the current beta version of Firebug, and maybe are waiting for a later release. Whatever the reason, I sure hope they release a new version for Firefox 3.5 and Firebug 1,4 soon, because it’s a great extension. Therefore, don’t worry. At least as a web developer, virtually all vital extensions are ready! The release of Firefox 3.5 is very exciting, and I’m really happy it’s out now! I should also mention to you Swedes out there, at least those that are Stockholm-based (or willing to travel), there will be a release party later this summer! However, since all of Sweden seem to be on vacation during July, this will probably take place in August. Stay tuned! On Windows, it is easier to use Firefox Portable for older versions than creating multiple profiles/shortcuts. Absolutely, that's a good option too. Thanks for the tip! 3.5.2 I have this new browser, and Cuá, I just upgraded a while ago. According to everything I have, from 3.5, with GMDesk, I can not take the links as it had in version 3.0 of Firefox, that it could drag and drop links to Firefox. And it worked wonderfully! But with this new branch hace3 already taken a little over a month, the thing is no longer the case. If you drag a link from GMDesk because I do not want either to operate or shot. Even using other preferences, or creating a new preference in the same browser. Now it is no longer the same. No Govt. I do not know if the problem GMDesk, or rather, a new feature of the new browser, I do not understand why they have to remove that mission they had before. Interesting. I have no idea why that has changed, and what could cause it. In case anybody else bumps into the same issue, note that you must close any open Firefox windows before launching the profile manager. If you don't, "firefox -p" may just open up a new window with your home page. See the <a href="http://support.mozilla.com/en-US/kb/Managing+profiles?s=profile%20manager#Starting_the_Profile_Manager&quot; rel="nofollow">help page on Profile Manager for details. It seems that this is not the problem. The problem is that, apparently the Firefox has a special and internal configuration under Windows (on Linux no problem, because it works very well drag and paste the GMDesk). So, has a lot on this issue I raised earlier this year, since it is a domestic issue rather than anything else, and we do not solve it easily. There is no bloody profile manager in Firefox 3.5.5! I have tried every conceivable option and Windows just keeps telling me "Can't find Firefox". I have tried "Firefox.exe -p", "Firefox.exe -profilemanager"; I have tried typing in the complete path to the bloody exe file and it STILL doesn't know what I'm talking about! When I click OK, all it does it open my homepage! Either this is a Windows problem (in this case Windows 7 64-bit Ultimate), or Firefox. Either way, I can't access this Profile Manager anywhere. It's not in Firefox 3.5.5! It's not even in the Firefox folder! Try the information in Firefox 3.5 – Windows Vista and 7. Alternatively, use the terminal in Windows to go to the folder with Firefox.exe and then run <code>Firefox.exe -profilemanager</code>.